My daughter picked this out as a Christmas gift for my son and son-in-law who love to grill/smoke and then compare their cooking. My son was thrilled with it but have not given to my son-in-law yet. SO, I purchased two more, one for my boss who loves to grill and one for the trainer at the gym. I think they will be pleased! I have tried light and heavy barbecue tongs. I tried short and long barbecue tongs. Some of them will scrape off the seasoning when you twist or flip your steak. However, I fell in love with these the first time I used them. They have good leverage with minimal pressure, they open wide without having monster hands. Easy to clean, nice to use, can flip salmon To a heavy steak. The only thing that I can see that might be a negative for me, is they feel a tiny bit loose. I may hammer the rivets tighter, just slightly. Still my favorite barbecue tongs out there. Have used it only 3 times but have found it great. Looking for a good grill that was strong,light and the handles stay cool. This is it. I bought this as a gift for my husband. It’s his new favorite grilling tool! 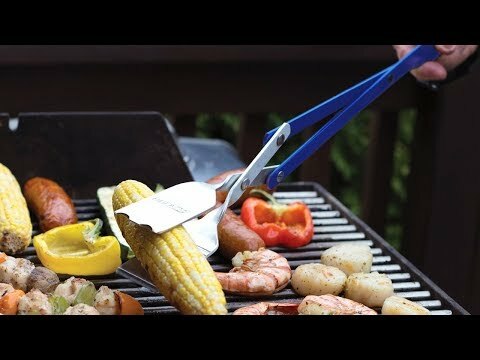 Easy to use and great for turning or picking up anything you have on the grill. We are using this nearly every day now on our BBQ. I bought this for myself and loved it so much I bought it for my son and sons-in-law for father's day. 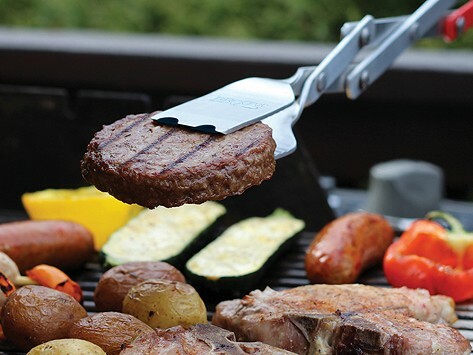 One tool can clean your BBQ and also turn your hamburgers and hot dogs. It is easy to clean which is also great.